What CAD format, and what version, did that colleague just give you? Most of the time it’s clear what format it is, and most of the time the version doesn’t matter, BUT – sometimes it does. This is a repost from a few years back. It has turned out to be one of our most referenced resources, so here it is again! 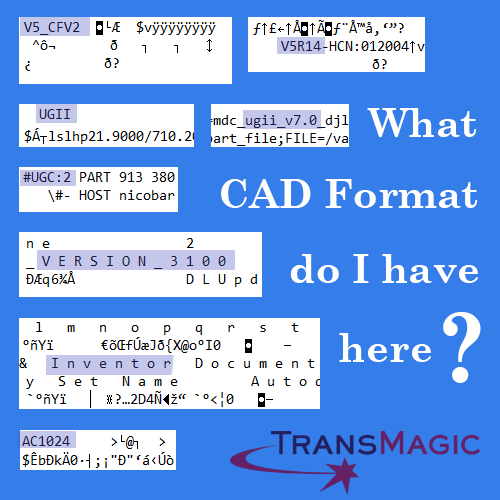 The following CAD Format Analysis cheat-sheet will allow you to open up CAD files in a text editor like Notepad or Notepad ++ to find out what format they truly are, and in some cases, which version. I’ve seen cases from some of our customers where CAD files had, for whatever reason, been given the wrong extensions; once we learn the correct format, we rename the file and problem solved. Other times looking at the text inside the file can help us determine if the file is corrupt or if it is a newer version than the customer’s software currently supports. V4 part and assembly files end in *.model. V5 and V6 3D files end in *.CATPart (parts) or *.CATProduct (assemblies). For V5 files, if you search on CATSummaryInformation or LastSaveVersion you will find the last saved version, the release, service pack and minimal version to read. UG/NX part and assembly files always end in .prt. In Notepad: UG or NX files will contain and normally start with UGII (that’s UG with two big letter i’s). Search on “ugii” to find the version, for example: ugii_v7.0. In Notepad: Search on I n v e n t o r (“inventor” with spaces between each letter). In Notepad: The first characters should always be AC, followed by a four-digit number. Each four-digit number is tied to a triad of release years. Hopefully this info helps you solve some of your own file mysteries. If you find we’ve missed something and want to share your knowledge, let us know at social@transmagic.com.